It&apos;s funny how we grow up in a certain part of a state yet sometimes we still don&apos;t really know much about it. Take for instance where you live, hop in a car and drive an hour in any direction. How much do you know about the places that you would end up? Sadly most of us would say we don&apos;t really know much about those places. After having talked to my daughter about places she would like to go for a short spring break trip we decided it was time to start exploring our own "backyard" right here in Indiana.We knew with my son working that we only had a few days to venture out so we decided to make it a shorter trip this time around. So we took in account driving time and settled on heading up north about an hour for our mini spring break. And after several visits to the South Shore CVA website to plan our trip we were ready for spring break to come! 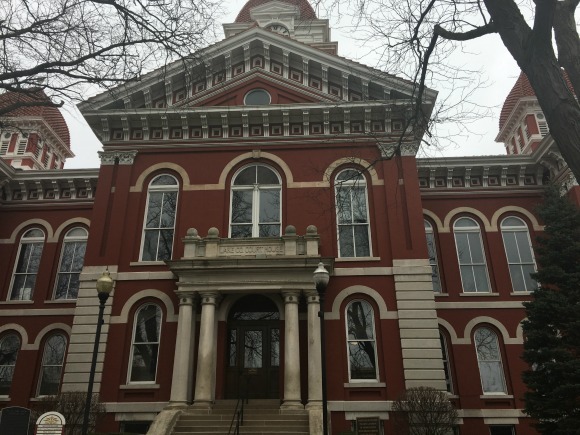 We started our trip off with a visit to the John Dillinger Museum located inside the historic Lake County Courthouse in Crown Point, IN. A town I can honestly say I&apos;ve never actually stopped in. We&apos;ve passed through it several times heading up to northern Indiana for other trips but never really given it a second thought. 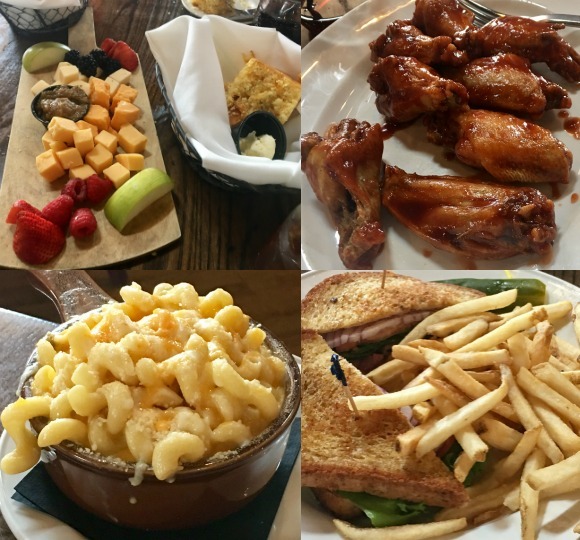 After this trip though we are already talking about heading back this summer to check out a few other hot spots we learned about while on our trip. 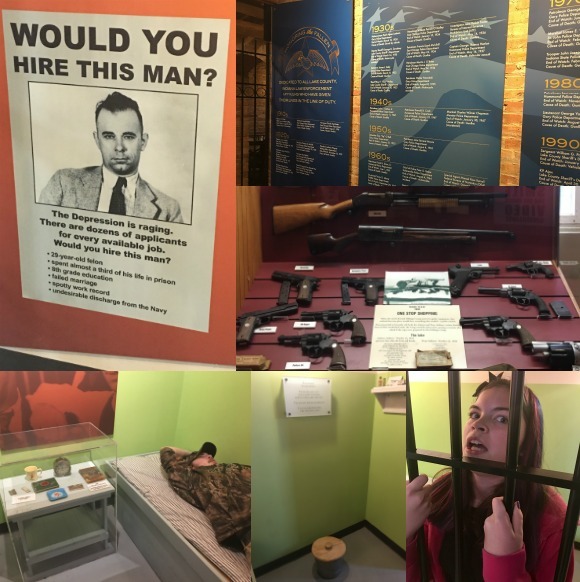 If you know who John Dillinger was you know he was an infamous gangster, so like my husband and I at first you&apos;re probably wondering why anyone would dedicate a museum to a gangster. Well, it&apos;s not really to honor him, but to show how the criminal activities of Dillinger and other gangsters have transformed the FBI and crime-fighting technology. We found it quite interesting to follow his life from just an average everyday man to a well-known criminal and how it all came to a screeching halt when he was shot and killed. The museum is appropriate for all ages and is very educational. At the end of the tour, there is even a very nice memorial honoring the men, women and K9&apos;s of Lake County, IN who have died in the line of duty. My kids thought the best part was the little jail cell they had set up where you could get a feel for being locked up. I, for one, wouldn&apos;t be too excited about having to potty in a little corner bucket! It was a great learning experience for all of us and we each took something away from it so I was pretty happy. If you&apos;re ever in the area or have the chance to visit the area I would highly recommend checking it out. Once we were done with the museum portion of the visit we then headed down the hallway and visited many unique shops that are also located in the basement of the courthouse. It was really a neat thing seeing all the shops and their offerings. There were shops with antiques, apparel, toys, candy, homemade goods, a vinyl shop, a clock repair shop, and a few others I don&apos;t recall off the top of my head! 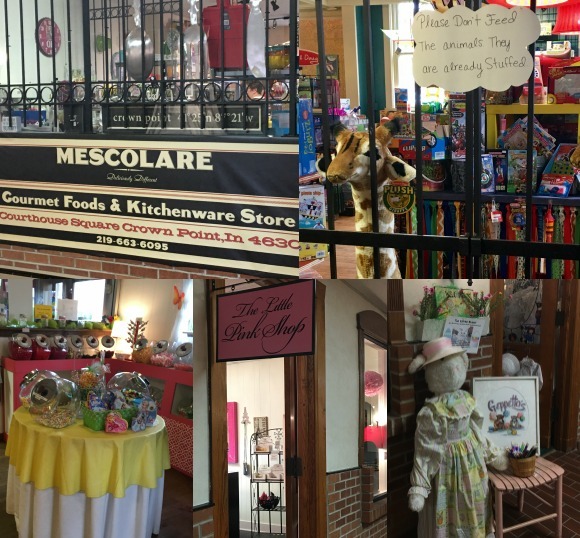 My favorite though was the candy shop and a little shop by the name of Mescolare. It&apos;s a cute shop that carries gourmet foods (many homemade) and kitchen wares of all sorts. It has a ton of cute stuff to offer from many local area business people. The couple that owns the shop was so nice, offering us many suggestions of places to visit in the area, which is what prompted us to decide we want to come back in the summer. 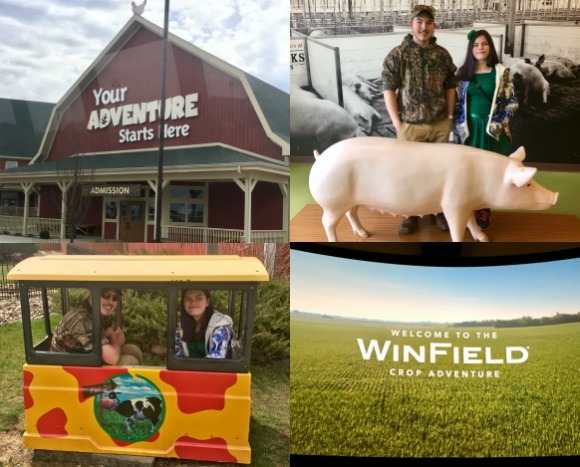 After we finished up our visit to the museum and the shops we hopped in the car and headed a little further north to Merrillville, IN. We&apos;ve actually been there a few times so I was already familiar with the area. A few years back we actually took a trip to Deep River Waterpark for a family fun day. 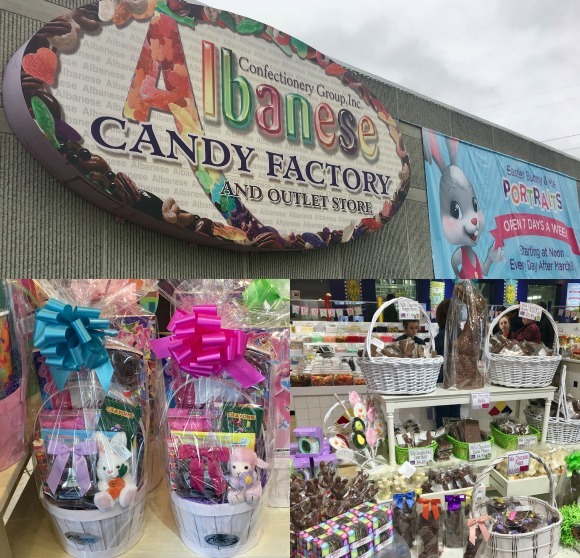 One of our other favorite places to stop while in town is the Albanese Candy Factory. They have a nice retail store attached to the front of the factory so you can shop all of their freshly made confectionery goods. We were there at just the right time too because with it being Easter shopping season they had a ton of Easter baskets and themed goodies! The kids and I probably spent 1/2 hour just walking around taking it all in trying to decide what we couldn&apos;t leave without! I would have to say of all the gummies I&apos;ve ever had they have to be my favorite. While out running around we stopped to eat at Joe&apos;s Crab Shack (best hush-puppies I&apos;ve ever had hands down) and did a little shopping at the Southlake Mall. 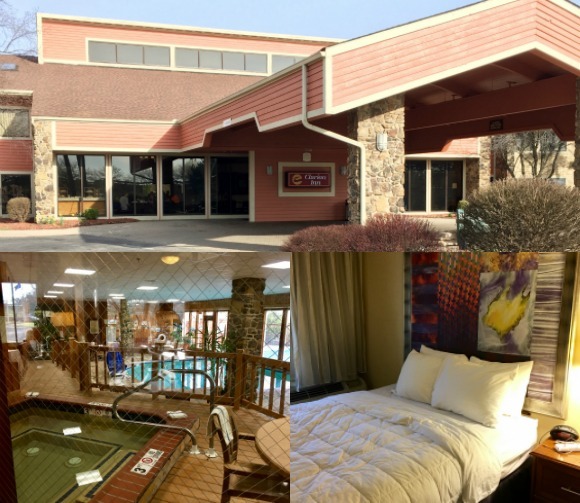 Once we decided we just couldn&apos;t fit in any more fun and adventures for the day we called it a night and settled into our hotel room over at the Clarion Inn. It was right off the highway so it was super close to everything and made it convenient for heading out in the morning. One thing I&apos;ve always loved about staying in a hotel is that you can just relax and unwind. No looking at all the things that need to get done when trying to relax at home. There&apos;s time to just hang out in the room and watch TV, or soak in a nice hot tub full of bubbles! Plus the next morning someone else cooks your breakfast, and who doesn&apos;t love to be served breakfast as soon as they are out of bed! I know for me it&apos;s my time to splurge a little and have all of my favorite breakfast foods. 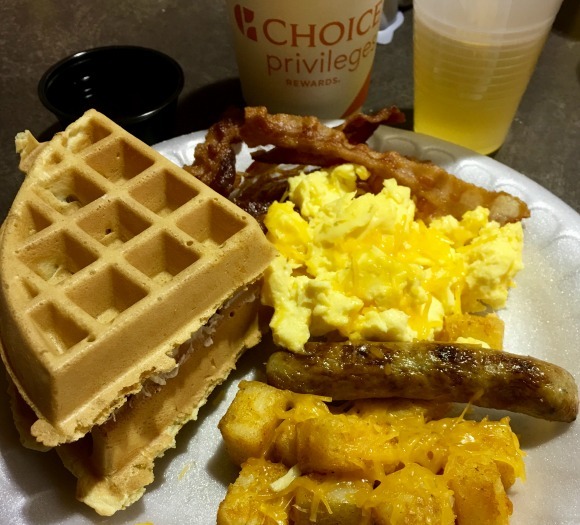 There&apos;s nothing better than a hot breakfast buffet where you can have a little of everything. And I have to say Clarion Inn did a wonderful job with their breakfast line-up. The food was all fresh and hot, and there was plenty for everyone. We all got up fairly early so we ate our breakfast, took our showers, then packed up and headed out to get an early start to the day. 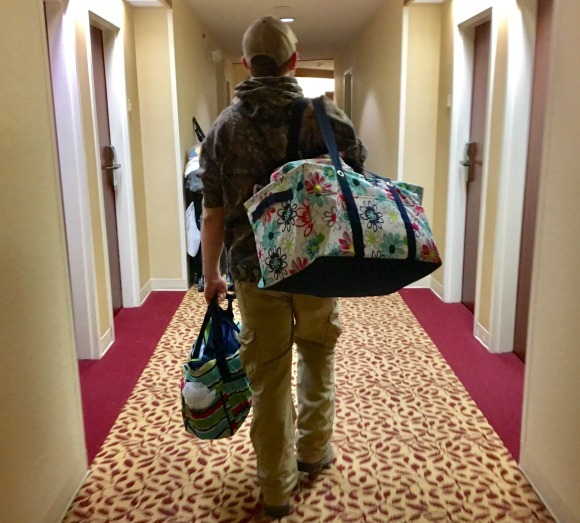 Of course, what kind of mom would I be if I didn&apos;t take advantage of the photo opp of my son toting my thirty-one bags down the hallway for me? Such a sweet kid taking care of his mamma on the trip for sure. I&apos;m sure he will thank me for this photo somewhere down the line...well maybe not, but at least it&apos;s a fun memory for the scrapbook later! We only had one stop on our itinerary for the day because we knew it was going to be an all day adventure. Plus we didn&apos;t want to have to rush through anything. I&apos;m sure by the roadside signs in the photo above you&apos;ve probably already figured out where we were headed...Fair Oaks Farms. We&apos;ve actually been to Fair Oaks Farms before, but it&apos;s been several years ago and they have added lots of new stuff since then. We had really enjoyed it before, so I knew it would be even more fun this time for their new adventures. Plus, we had plans to visit the Farmhouse Restaurant for lunch! When you get your tickets in the "Your Adventure Starts Here" building you have the option of doing the cow adventure and/or the pig adventure. The new crop adventure is included when you purchase either or both the cow/pig adventure. So no matter which way you go you&apos;ll have at least two adventures to go on. I would say if you have an entire day do them all because it&apos;s well worth it. You&apos;ll also schedule your bus tours (for the cow and pig adventures) when getting your tickets to save time later. This makes it super easy because you don&apos;t have to wait in a line to get on a bus or worry about scheduling one later in the day. We knew we had lunch plans at noon so we did one tour before and one after lunch and it worked out perfectly. Our first adventure was the Cow Adventure. First, we stopped by the birthing barn since we had a little time before our bus tour. It&apos;s here that you&apos;ll have the possibility of seeing a baby calf being born. We&apos;ve seen it before so it wasn&apos;t a big deal that we missed it this time around. 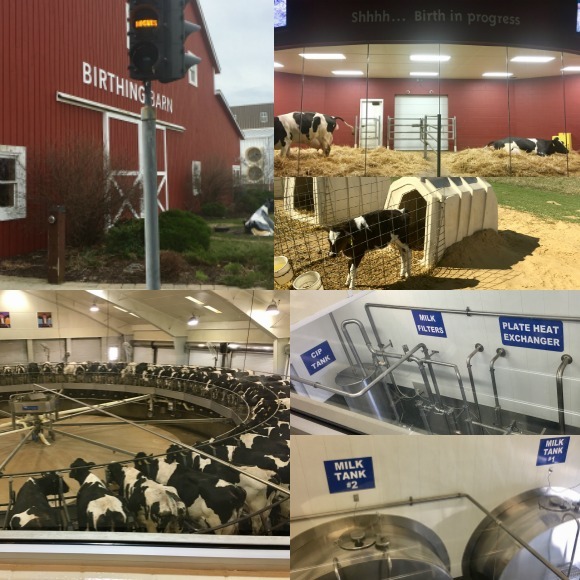 Once we were done checking out the birthing barn we headed over for the bus and took the tour of the facility where the cows live and are milked. It&apos;s down the road a bit from the farm for the protection of the cows. It&apos;s actually a really neat adventure to take and learn all about the process of milking cows. 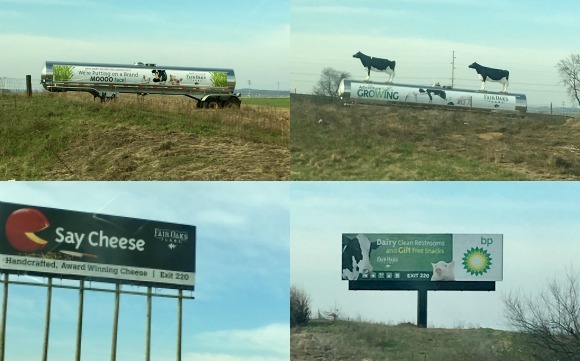 Once you&apos;re done with the tour the bus brings you back to what I call the educational center that has all sorts of great exhibits to learn about cows and even "have your own try" at milking a cow! Okay so not a real cow, but it&apos;s still pretty cool to try. Next, we hopped over to the Farmhouse Restaurant and had lunch. And let me tell you lunch was amazing. They pride themselves on using foods that were made from ingredients grown and harvested (or raised) on the Fair Oaks farm, or other regional farms. I have to say it was the best "home-cooked" meal I&apos;ve had in a long time. After lunch we headed over for our Pig Adventure bus tour. Again it was located a bit down the road for the protection of the piggies. 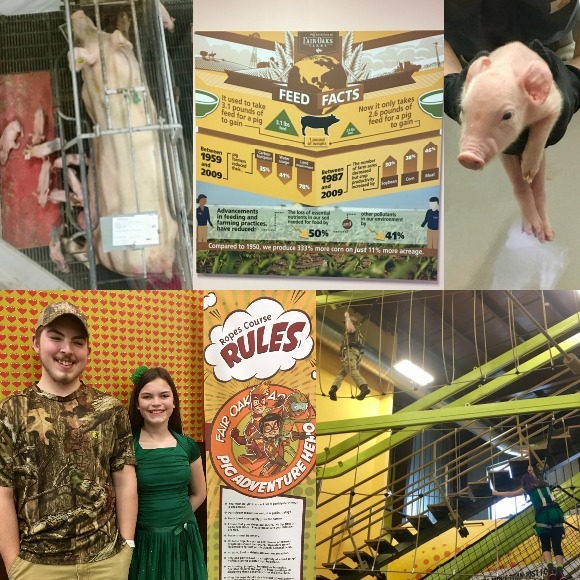 We got to see lots of pigs and learn a lot about them reading the signs on the wall and doing various tasks at the interactive exhibits. While there we got to see lots of little pigs including one that had just been born a short time before our arrival. I thought that part was really neat to see how they acted right after birth. Once we were done there we took the bus back to the main farm again. The kids got to do a fun indoor ropes course when we returned from the adventure so that was pretty exciting for them. And our final adventure was the Crop Adventure. It wasn&apos;t quite as exciting as the other two since there weren&apos;t any live animals, but it was still really interesting. 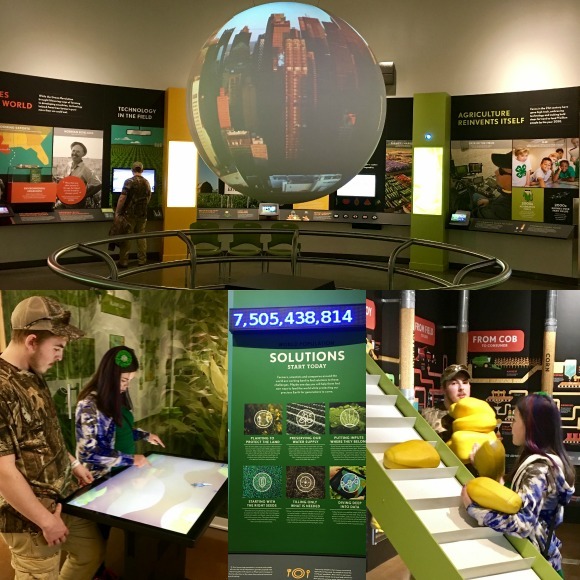 We started off with a short video about farming and then took a self-guided tour that included many interesting facts and interactive stations. The kids enjoyed doing some of the activities together which was nice to watch. Plus it gave me time to read through some of the facts found on the walls. The thing we all agreed was really cool was seeing the little digital read-out that told the current world population. WOW! That was a big number! We actually stood in front of it long enough to watch it change as babies were reported being born. It was fun doing the interactive stations, but for me, I really enjoyed all of the information that was presented. So many things you never realize that have to be thought about and planned in regards to farming. There is honestly so much to see on the different adventures I could probably do a separate detailed post on each one of them. I&apos;m sure you can tell that though from the photos. We had a great day despite a nice rain storm coming in the afternoon. Pretty much all of the activities are indoors so even on a rainy day there&apos;s lots of fun to be had! As you can see you really don&apos;t have to go far from home to have a good time on a trip. Exploring the "backyard" of your hometown can actually be very rewarding and fun at the same time. From here we decided to make it our mission starting this summer to visit even more places around Indiana. It&apos;s never too late to get out and learn about what your state has to offer. Our time is NOW! Read more travel blogs by Stacy at: http://stacytilton.blogspot.com/p/travel-indiana.html. Stacy is a stay-at-home mom of two children and loves spending time with her family. She likes to craft, cook, and travel with her kids so they can learn new things. Her blog is a place for her to share about everything they do so others can learn, too!